Drift off to sleep in pure bliss with this three-piece comforters set. 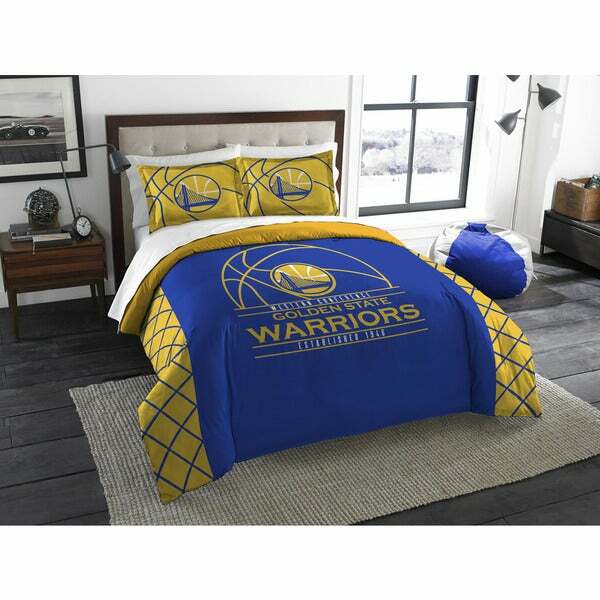 The polyester material lulls you into slumber, allowing you to dream of endless championship titles for the Golden State Warriors. NBA logo is very well made and looks exactly as pictured. Colors are spot on...no Chicago fan would be disappointed! The only drawback is that it is not very heavy since there is not much filling in the comforter. This would work very well in a kids room. I am very pleasantly surprised with The Northwest Company NBA Golden State Warriors Multicolored Full Queen 3 piece . The most helpful feature for me, is great quality, good product and service. Definitely recommend one! My son loves his new room! My son loves this comforter set. Looks great in his room and is very comfortable. Would definitely recommend it for any Golden State Warriors fan! My 9 year old is a huge Golden State Warriors fan! I got him this for his birthday and he was so excited. The colors are bright and the perfect shades. The comforter fits his bed great! It is warm but not too warm since we are going into the hot weather. He said it was his favorite gift ever! My son absolutely loves this comforter set. For the price I was pleasantly surprised at the softness of the material. Kind of has a soft t-shirt feel. The colors are right on and it fits well. The price was the best I found. Would recommend. Great gift for my 10 year old son. 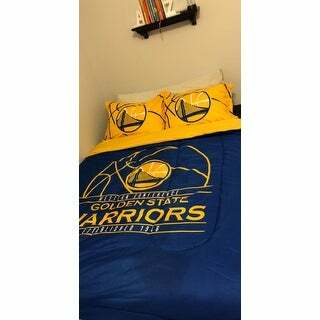 He loves Golden State and loves the comforter set even more. NOT cheaply made. Will be buying my next set from Overstock. Hey, my name is Kimberly and I just purchased this item. This is one of my favorite teams so I had to get this Comforter Set. Hope I enjoy every bit of it so far I've seen good reviews. I also like the fact that I don't have to wait so long for it to reach me. 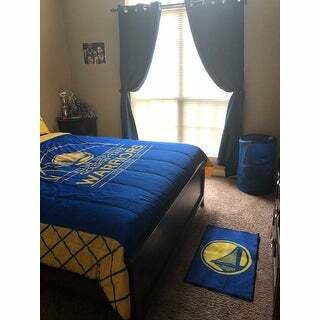 My son really loves his Golden State comforter set. The only Issue I have, you would need a king size for it to fit good to a queen size bed. Good quality. Exactly as advertised. Used with white sheets and looks amazing in my son’s room. Size fits his queen bed perfectly! He’s a huge Stephen Curry fan! I would recommend. Looks exactly like the picture. Great look for my son's room. Soft feel. The color is great. The thickness of the comforter is lighter weight than I thought it would be, but it was still a great purchase! My 13 year old loves it! My 14 year son got this comforter set for Christmas last year and he absolutely loves it! It has been washed several times and it still looks and feels the same as it did when I first bought a year ago! Great comforter. My son loves it. We bought this comforter set for our grandson and he loves it for his new bedroom! Thanks for helping us put a smile 😃 on our grandson’s face! Peace! The pillow shams ripped as we tried to put a pillow in it, but otherwise product is great! "does it come in twin size?" Yes, the twin size is sold under item # 20034868. My son's favorite team for his birthday 8-29-2005.